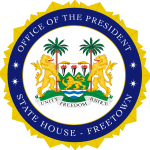 State House, Freetown, Thursday 22 November 2018 – Sierra Leone’s Ambassador to the Republic of Senegal, Alhaji Brima Elvis Koroma, has called at State House to bid farewell to His Excellency President Julius Maada Bio. Ambassador Koroma, who speaks fluent French, said he was excited about the opportunity to serve his nation under the New Direction in the Francophone West African country. He commended President Bio for the confidence reposed in him to represent Sierra Leone in Senegal and its accredited nations, saying that his appointment was a testimony of the trust in his ability to represent the government and people of Sierra Leone abroad. With education being the flagship project for the Bio administration, the new Ambassador disclosed his intention to awaken the interest of school going children in learning French as a second language, noting that the acquisition of a second language was an added advantage that would open a wide range of job opportunities for the country. He said he was aware of the herculean task the new administration was faced with in moving the country forward into a prosperous and stable nation. He added: “As I leave today, you should be assured that I will not only be representing your Government in Senegal, but I will also own your vision and translate it into a concrete result for the good of our country,” he ended. Minister of Foreign Affairs and International Corporation, Dr Alie Kabba, said Senegal was a country that has stepped up in her relationship with Sierra Leone since the assumption of office by President Bio. He noted that Ambassador Koroma was a perfect selection, especially with his ability to speak French, adding that his ministry was happy about his appointment. In his brief remarks, President Bio congratulated Ambassador Koroma in his new role. He maintained that the two countries had developed a strong relationship. He added: “I am particularly sure that you will serve Sierra Leone well. We look forward to you deepening and widening our relationship with Senegal. You can always count on the Ministry of Foreign Affairs and my very self for support. I wish you well in your new posting,” he said.